The Elks Temple in an undated photo. Long a glamorous, outstanding example of Neo-Gothic Architecture and the powerful force of fraternal organizations, Los Angeles’ Elks’ Temple #99 still stands proudly at 607 S. Park View St. across from MacArthur Park. Now mostly an empty shell, the striking building once housed a busy Elks’ Temple that hosted all manner of social groups, an almost holy place that exalted the power of fraternal groups to better living conditions, educational skills, and the ongoing life of their surrounding communities. The Benevolent and Protective Order of Elks” Lodge #99 was one of Los Angeles’ premiere fraternal and charity organizations, founded in 1888 in downtown Los Angeles. The organization allowed men to gather together in friendship as well as providing services to the community such as allowing children to grow and thrive, feeding and clothing the needy, culturally enriching their neighbors, and honoring American veterans. Originally housed on South Spring Street, the organization outgrew its location in 1908 and moved into a larger, more elegant facility on Third and South Olive Street at the top of Angels’ Flight. By 1920, the organization once again was searching for a new home, and considered buying a couple of properties over the next couple of years. A postcard showing the lounge of the Elks Temple, listed on EBay as Buy It Now for $15.99. On October 8, 1923, Michael Shannon, President of the Elks’ Building Association, announced that the organization intended to construct “an imposing temple” costing more than one million dollars at Sixth and Park View Streets. The group paid Mary Newman and Lange & Bergstrom $262,000 for the property, which adjoined Otis Art Institute holdings on Wilshire Blvd. Planned facilities included public and private dining rooms, social halls, an auditorium to seat more than 1500, social lounge, billiard rooms, and a swimming pool. The grand lobby entrance to the building would soar fifty feet high and twenty five feet wide, in scale with the 156 foot tall building. Each of the public rooms would impress with their size. The memorial room extended fifty two feet in diameter and forty feet high, and the 1500 seat lodge room would be 136 feet in length, seventy seven feet wide, and fifty five feet high. The banquet and ballroom would provide accommodations for stage presentations as well. A matchbook showing the Elks Temple, listed on EBay as Buy It Now for $4.24. Handball courts, fully equipped gymnasium, and other recreational facilities would occupy the second floor, with band and glee club rooms, directors’ rooms, seven private dining rooms, grill, billiard, and card rooms on the third floor. Two private roof gardens on top of the north and south wings would provide excellent views over the entire district. The upper seven floors of the twelve story building would house the hotel for out of town guests, with 175 hotel rooms, each with private bath. A two-story garage housing 350 cars would also possess ten handball courts on its roof. The basement would contain six bowling alleys, haberdashery, men and women’s dressing and shower rooms, Turkish baths, and swimming pool. Pacific Mutual Life Insurance Company helped the Elks arrange financing, loaning the Elks’ Building Assocation $900,000 to construct the building on May 14, 1924. Elks rejected the first bids by construction companies on September 25, 1924, but did hire Scofield Engineering and Construction Co. to build their temple. On October 27, the group announced they would break ground on the facility for their 4300 members at 8:30 pm Wednesday, with the United States Naval Reserve Band and the Elks’ band and glee club performing and various speakers saying a few words, including several former Past Exalted Rulers and lead speaker, United States District Judge Paul McCormick. Dec. 28, 1926: The Times writes about the Elks Temple organ. Working day and night, construction workers laid the cornerstone March 25, 1925. Grand festivities included performances by the Elks’ lodge bands, glee club, drum and bugle corps, and drill teams, seven distinguished elks speaking, and Isidore Dockweiler acting as principal speaker. The Board unanimously approved adding the Golden Rule on a tablet above the fifty foot arch at the building’s main entrance, along with other phrases to line the building, which the group would not make public. They hired Anthony Heinsbergen to design and create murals and other elaborate paintings for the interior. On May 12, 1926, the Elks dedicated their luxurious $2.5 million dollar temple, a place to worship and serve together as brothers. Over 3000 Elks attended the event, spilling out of the ballroom and into the halls, stairway, and entrance of the building. Organist Sibley Pease played special music suitable for the occasion. Chaplain Herbert Kincaid noted that not one worker was injured or died during construction of the building. The Memorial Hall was dedicated to Spanish American and World War I veterans who gave their lives defending their country. A detail from an ad for the Elks Temple, May 13, 1926. Upon completion, the Elks’ Temple included a main dining room, kitchen and patio on its lobby floor, along with ladies’ parlor, lounge, barber shop, check room, cigar stand, coffee shop, writing office, and hotel and executive offices. The second floor contained publicity offices, the banquet and Memorial Halls, Lodge room, and women’s lounge. The third floor featured fully-equipped gymnasium and handball courts, with the fourth floor containing private dining rooms, billiard rooms, parlor, reading room, and other special rooms. The hotel occupied the upper floors of the building. From its’ beginnings, the spacious temple hosted all manner of activities for its’ members, including special balls, teas, dances, and bridge tournaments, along with opportunities to participate in such sports as bowling, basketball, baseball, water polo, handball, golf, aviation, and yachting. Special talks, educational opportunities, and service commitments also occupied members’ time. Thousands of members belonged to the organization, and continued to join, hoping to be a part of a group that gave so much to others. Of course, the Elks hosted national conventions of their organization as well, giving them a chance to show off their glamorous surroundings. Important social organizations immediately booked the facility for their special events. The Los Angeles Realty Board, Southwest Branch, held their June 1926 graduating exercises and balls in the dominating temple. Los Angeles Theatre Organists Club were allowed to practice on the organ to help promote it to the general public. Memorial and funeral services occurred in the building as well, led off by services for James Keeler, a former Civil War veteran and internationally known newspaper man, who suffered a stroke in the hotel. On June 2, 1927, a full police honors funeral service was held for Assistant Police Chief A. W. Murray, featuring fireman’s band, drill teams, and honor guards. Actor Theodore Roberts’ funeral was held at the Temple December 18, 1928, with over 2000 people attending, including director Cecil B. DeMille. Actor George Fawcett gave the main eulogy, and actor Conrad Nagel sang at the services. Cultural organizations scheduled performances in the glamorous building as well. Shakespeare scholar Frederick Warde gave a series of speeches and performances in 1926 and 1927 highlighting the works and life of William Shakespeare. Organist Pease gave a series of organ concerts showing the dramatic range of the console. The Elks offered special events for children as well, holding dance recitals and classes for local children. They would of course offer charity events at Christmas and Easter for those less fortunate as well. On February 24, 1928, radio station KNRC of Santa Monica set up a remote control line to broadcast radio programs from the Elks’ Temple. Opening night entertainers included the Zoellner Quartet, the Elks’ Band, actor Ford Sterling, emcee Charlie Murray, and the Bavarian Yodelers. Regular broadcasts began emanating from the dramatic building. Later, radio station KMC took over the broadcasting facilities of the organization. During the 1932 Olympics, the Elks’ Temple hosted some indoor swimming events like water polo. A postcard showing the Elks Temple, listed on EBay as Buy It Now for $9.99. Many women’s groups over the years booked events at the Temple, including Daughters of the American Revolution, Daughters of the Confederacy, women’s social clubs, charity groups, book and theatre groups, and the GOP Women. Contract bridge groups held competitions, both local and national. Religious groups booked the facility as well, with everything from local Protestant organizations and churches holding events to the Moslem Association in 1958. The Sister Kenny Foundation hosted doctors and others to discuss how to treat the medical needs of the less fortunate. The Elks took great pride in trying to meet the needs of the community, and they gave needy or lonely children an opportunity to celebrate various holidays over the years. For many years they held Easter egg hunts or events, Christmas parties, or Halloween events. On December 16, 1951, the Elks hosted 3500 children with a visit to Santa, followed by a vaudeville and clown show and presents. A few unsavory events occurred over the years as well, such as the vice squad raiding the Temple May 17, 1948 and confiscating ten illegal slot machines that some members were operating. a 72-year-old member was accosted in the restroom on April 1, 1950, and it appears his attacker was never caught. Despondent 65-year-old Maurice Finklestein committed suicide October 17, 1950, shooting himself. By the 1950s, the Elks saw declining membership as older members began dying off and fewer younger members joined. More opportunities for children became available at schools and sports leagues, and fathers began focusing their extra free time there. Less people joined fraternal organizations, concentrating on their churches or other social institutions. As the neighborhood changed, many members moved away, dropping membership rolls as well. Though events continued, it became more difficult for the Elks to meet expenses in maintaining the facility. Ads in the August and September 1966 Los Angeles Times note that the building would be placed up for auction Monday, September 19, 1966. Advertisements pointed out that the facility possessed frontage on Sixth Street, 159 hotel rooms with baths, and over 175,000 square feet, offering many opportunities for buyers. Baur Properties purchased the Temple November 26, 1966 for $700,000 from the Elks, giving them the opportunity to lease it back. By the 1970s and 1980s, the Temple held punk rock concerts, served as a youth hostel, operated as the Masque Theatre, and continued operating as the Park Plaza Hotel. The building earned Historic Cultural Monument landmark #267 from the city of Los Angeles in 1985, while being leased for a variety of activities. Various groups have suggested restoring the building and reopening the structure as a boutique hotel or social outlet, instead of the rental facility it appears to have become. 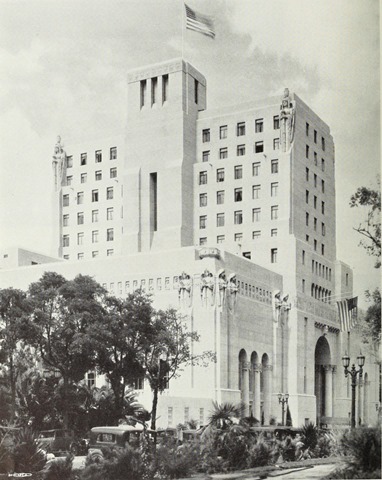 Now mostly leased for special events, corporate outings, weddings, and location filming, the Elks’ Temple and its eye-catching facade represent the early power and draw of fraternal organizations to make a forceful and positive impact on their local communities, generously supporting and encouraging the less fortunate. This entry was posted in 1926, Architecture, Hollywood, Hollywood Heights, Mary Mallory and tagged 1926, architecture, Elks Temple, Hollywood Heights, Mary Mallory. Bookmark the permalink. This is a great read – thanks for sharing. I went to some of those punk rock concerts at the Park Plaza in the 70s as well as rock nights called “Power Tools” and “Club With No Name” in the 80s and early 90s. Great memories. I was once told by a security guard that he believed, based on personal experience, that the place is haunted. He also told me there’s a tunnel between it and an apartment building on the north side of 6th street just a bit west of where the PP stands that was used by the members to escape raids during prohibition and possibly even when they were partying and carrying on with some ladies of the night based in that apartment building. I didn’t see the entire tunnel but did see the entrance, or at least what he claimed was the entrance. Yes, I have pictures of the actual lodge room. Lodge room of 99 was huge enough you could hold a football game inside of it! But, the New York Elks Lodge #1 in NYC on west 43rd street was even more jaw dropping than Elks Temple#99. Don’t look for it on 108 west 43rd street it isn’t their any more since it was wrongfully demolished in 1994. By a family reality company wanting to build a bank on the property. If you were smart you’d gone and seen it in the early 1990’s. Spike Lee’s movie Malcolm X. The huge lodge room is dressed up a little and you couldn’t tell at first glance it is the past New York Elks Lodge room. If you don’t know what to look for or for it. It’s the 2nd or 3rd scene called ” Rose land” ballroom dance scene and in the end when Malcolm is assassinated the scene takes place in the New York#1- Lodge Room painted a tope grey from the lodge room floor to the 2nd floor balconies that over looked the large lodge room floor. There is a scene in the basement of the lodge. Where Malcolm is getting to address the crowd the day of his death and things aren’t going right for him and his new group and argues with his volunteers of his new temple. That was shot in the basement of the old NY Elks lodge. YouTube has a 1982 video of David Johansen performing for MTV’s first New Year’s Eve broadcast from inside the X- lodge room now concert Grand Ballroom. Silly but yet fun 80’s punk pop rock music was taken in that night. The New York Elks Lodge was foreclosed on by the Bank of Savings and Loans. It was sold to member of #1 named J. Edward Saltzman and became a catering & rental ballroom called the Delano Hotel. Investors grew and it became the Diplomat Hotel on 108-116 west 43rd street. So check those video’s out and get the chance that most Elks would of dreamed of to tour the old New York Elks Lodge#1 building through video from the past that still exists. If you did get go into the building in real life consider yourself lucky. I know most Elks and including myself learned about the building location one to many years to late after it was demolished like I said in 1994! Yes, I do have several pictures of the New York Elks Lodge #1 on 43rd street and 6th ave.
just send me an email if you are an Elk and I will gladly share our historic history that most Elks and people have never seen the likes of this awesomeness ever before. NY#1 Elks Lodge had it going on and was a jaw dropping experience to be a member of and stair at its architectural designs. Here’s to the New York Elks Lodge #1. The best Elks Lodge ever! Did you take any pictures in the Elks LA Temple when you were their? If you think LA Elks Temple #99 was big and grandios. Try NY Elks Lodge #1 in manhattan! LA is pail in comparison to NY#1’s ornate building from 1911-1934! If any one or this sight would like the real cool pictures of the Elks Temple when Elks owned the building send me an just let me know on here! Hey Jay , Im a member of Tacoma lodge 174. I would love to get some photos of that place. Lou Kruse email me at jmcdrums@aol.com and I will send you photos of the big Tacoma, Washington Elks Temple #174! Up to you in contacting me! I have plenty other large Elks Lodge building photos as well. Wish I had not on the New York Elks Lodge #1 that was located on 108-116 west 43rd street in Manhattan! My Grandfather, Leon Hefflin used to rent it for dances for the African-American community in the 1940’s and 1950’s. The Los Angeles County Sheriff’s Boys Band rehearsed in the BPOE #99 building in the 1940’s, Monday nights. (I was a participant.) The Sheriff was Eugene Biscauluz, of revered memory. The Band conductor was Col. Vesey Walker, father of Tommy Walker of USC. The Sheriff liked to position his Boy’s Band behind his silver mounted posse in various parades. Staying in step and in tune behind the posse and covering several miles was a challenge for boys such as I was at age 8.